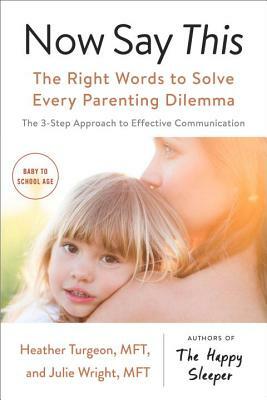 A powerful new parenting book that gives parents the exact words to solve any sticky parenting situation! Best of all, it answers the question, "Now, what do you actually say?" using scripts and body language from real life examples. Now Say This is a guide that transforms remarkable ideas into practical how-to's that busy parents can use right away. Heather Turgeon, MFT is a psychotherapist who specializes in sleep and parenting. Her writing has appeared in The New York Times and The Washington Post, among others. She lives in Los Angeles with her husband and two kids. She and Julie frequently speak at parenting centers and schools, and offer sleep consultations and individual therapy. Julie Wright, MFT is the creator of the Wright Mommy and Me, one of Los Angeles' best known mommy and me programs. She has specialized training and experience in the 0-3 years, interning at Cedars Sinai Early Childhood Center and LA Child Guidance Clinic. She divides her time between Los Angeles and New York City and has a son in college. "This positive guide offers easy-to-remember ideas and tactics for those moments, some tough and some seemingly simple, when parents just don't know what say. My favorites—'we're leaving room in our tummy for dinner' and 'we're taking a break from soccer to leave our afternoons free for other things'—are great examples of proactive, affirmative strategies that help our kids understand our choices and learn to communicate better themselves." "Heather and Julie’s techniques have given me the tools I so desperately needed to help my kids through their sad, angry, unrelenting moments. It has helped my husband and me to communicate better with them, and for them, in turn, to communicate better with each other as siblings." -Joy Cho, Founder and Creative Director of Oh Joy! "This immensely practical guide to the tough parenting questions is a life saver! With detailed explanations, stories, and scripts, Wright and Turgeon show how parents can be empathetic and loving, while setting limits. This wise and compassionate book brings the spirit of mindfulness to where parents and children need it the most— the really hard stuff. I can’t wait to try it out with my daughter!" -Diana Winston, Director of Mindfulness Education, UCLA’s Mindful Awareness Research Center, and author of Fully Present: The Science, Art, and Practice of Mindfulness. "Instantly useable. Their practical and compassionate method gets you unstuck from difficult parenting moments and gives kids the tools to grow into responsible, emotionally savvy adults." "Read through the eyes of a grandmother, I gained so much new and invaluable insight as to how to effectively and empathically communicate with my grandchildren." "The Happy Sleeper makes happier parents by unleashing their child’s natural ability to sleep with a sensitive, structured approach based on the authors' combined twenty years of clinical experience." "Clear a space on your bookshelf! You'll be consulting this friendly, research-based guide to the blessings of sleep for you and your little ones for many years to come."